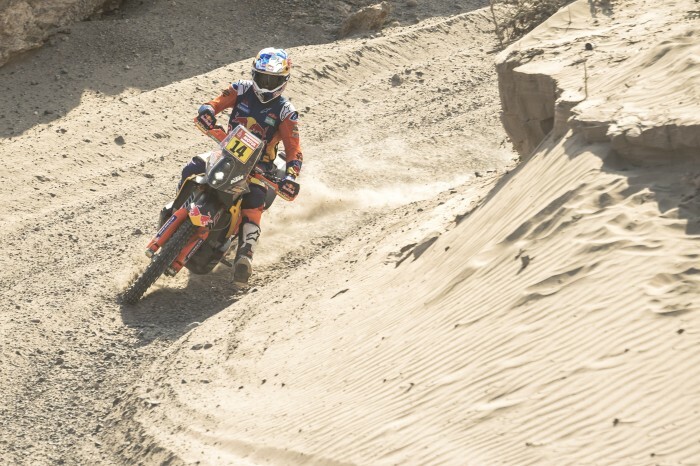 Britain’s Sam Sunderland scorched back to fourth overall in the 2019 Dakar with a soaring stage seven win. Capitalising on his start position of 12th, the Red Bull KTM rider immediately set about making time on the front runners. By waypoint three, Sunderland was ahead and despite a small error in the latter part of the stage, went on to win by close to two minutes at the line. With a number of his main rivals losing more time on the technical stage, Sunderland improved his position in the provisional overall standings to fourth and now trails leader Ricky Brabec by less than ten minutes. “I’m pleased with today, it’s gone really well and it feels good to get some time back on the leaders. Obviously, yesterday I was really disappointed. I opened the stage well but lost time after damaging my rear brake,” said Sunderland. “That upset my strategy a little but then today, I decided to use that frustration to my advantage and push as hard as I could right from the start. I did lose a little time right at the end when it took me a couple of minutes to find a WPC, but overall I’m happy with how I rode the stage.